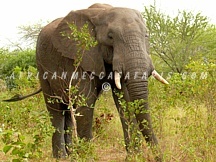 The Manyeleti Game Reserve is situated in the Limpopo province of South Africa. The reserve borders the Kruger National Park to the Eastern side, the Timbavati Reserve on the Northern side and the Sabi Sand reserve on the Southern side - each of these areas renowned in their own right for excellent-quality safari and wildlife experiences. What makes Manyeleti Game Reserve unique, however, is the exceptionally low human : land density ratios. With only two commercially operated lodges, a maximum of 8 safari vehicles traverse the reserve. Each vehicle therefore has the equivalent of 2937 hectares to itself. It can therefore be said that this is one of the lowest vehicle density private reserves in the greater Kruger Park region. 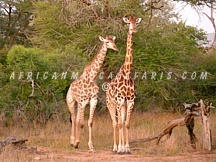 The Kruger National Park is one of the most diverse national parks in the world. It houses a vast array of flora and fauna. There are no fences between the reserves, which means that animals are free to roam unhindered. The size of Manyeleti Game Reserve is 23500 hectares. (58750 acres). In Manyeleti Game Reserve, there are only two commercially operated lodges based in the Manyeleti (Honeyguide Tented Safari Camps & Tintswalo Safari Lodge). With a maximum of 8 safari vehicles traversing the reserve, each vehicle will have on average 2937 hectares to themselves making this one of the lowest vehicle density private reserves in the greater Kruger Park region. The area has a subtropical climate which lends to warm rainy summers and a dry cooler winter. The main months of rain would be October through to March. The average rainfall for the region would be + - 500 millimeters a year. 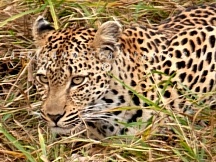 The Manyeleti Reserve is made up of two distinct types of Ecozones. The underlying rock types determine the nature of the soil that breaks down from them. The Northern part of the reserve is based on the Thorn Veld ecozone which in broad terms outline the younger surface of dark brown loams derived from the basalt. Typically one would find such tree species as Knobthorn trees, Transvaal Saffron, Large Leaved rock figs. Red Bushwillow, Round leaved-Teak, Marula, Jacket-plum, Russet Bushwillow, Tree Wisteria, Umbrella thorn, Weeping wattle and Zebrawood. Due to the soil types (Gabbro) this region abounds with sweet grasses which are highly edible for all the grazers. Predators found in the Manyeleti's Thornveld region would be Lion, Cheetah, Hyena, Wild dog, Leopard and Black backed Jackal. Browsers found in the region would be Kudu, Giraffe, Impala and Duiker, Bushbuck, Kudu and Nyala. 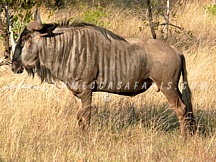 Grazers would be Wildebeest, Zebra, White Rhino, Waterbuck and large herds of Buffalo are common on this soil type due to the abundance of quality grazing. Uncommon sightings would be Black Rhino and Sable antelope. The Sou thern part of the reserve is referred to as the Mixed Bushwillow Woodlands Ecozone. The Mixed Bushwillow Woodlands Ecozone is found on underlying Granite bedrock giving rise to gently sloping hills and rocky outcrops with huge round boulders such as at the Koppies region in the reserve. Broad-leaved trees favor the higher upland areas while thorn trees prefer the lower-lying areas. Many rivers and streams are found in this region. A huge variety of trees and shrubs occur in this ecozone including various Bushwillow's, Leadwood trees, Silver cluster-leaf, Buffalo thorn, Sickle-bush, Weeping wattle, Apple leaf and Round leaf teak. In the riverine regions one can see huge Sycamore figs, Jackal-berry and Weeping boer-beans trees. The grasses growing in the above ecozone are mixed and sweet. Predators found in the mixed Bushwillow ecozone would be Lion, Side-striped Jackal, Hyena and Leopard. Browsers commonly found in the region would include Kudu, Giraffe, Impala, Klipspringer, Nyala, Bushbuck, and Steenbok. Grazers typically found in this region are many and varied such as Buffalo, White Rhino, Wildebeest, Waterbuck, Warthog and Zebra.